Island Peak climbing trip fulfills the dream of every amateur and serious climbers, who have been seeking the thrill of adventure and wish to widen their experience towards the peak climbing expedition beyond simply trekking in Nepal. Island Peak, also known as Imja Tse (6,119m), lies to the south of Everest and is one of the most popular trekking peaks. It was named Island peak by Eric Shiptons in 1953, as the peak resembles an island in a sea of ice when viewed from Dingboche. Climbing Island Peak is well within the reach of any fit and determined trekkers as it is not a technical, though demanding snow climb. 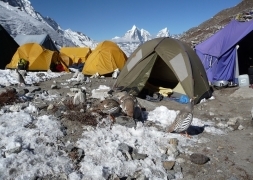 Embark on a wonderful adventure with Island Peak trekking and climbing that takes you into the heartland of the Khumbu Valley and also to Everest Base Camp (5,357m/17,575ft), where you can experience (especially in April/May) the atmosphere of the climbers who prepare themselves for the expedition to the peak of Everest. Island Peak (6,189m/20,305ft) is one of the main climbing peaks in the Everest Region with an impressive and highly glaciated West Face that rises from the Lhotse Glacier. The Island peak climbing itinerary has been designed very professionally by taking care of proper and gradual acclimatization at suitable intervals. Before scaling the peak, we also take you to possibly the most popular trekking destination in the world - Everest Base Camp and Kala Patthar - for the close up views of Mt. Everest and other high mountains. The journey begins from and comes to conclusion at one of the most famous airstrips in the world, the Lukla Airport in the Everest Region. Island Peak Climbing with Everest Base Camp Trek is designed for those adventurer seekers who are energetic and physically fit and wish for both trekking and climbing experience at one go. Please note that often the Kathmandu-Lukla-Kathmandu flight gets delayed by a few hours or may even be canceled for one, two, or more days due to unfavorable weather conditions. Such conditions may arise even in the best seasons. Hence, in such cases, you must be prepared for long waits both at Kathmandu or Lukla airports, as this can happen either at the start or end of the trek or even both! We do our utmost to avoid such delays, and fix you on next flight. Still, we suggest you to be prepared for possible delays/cancellation, and if possible to come with some extra buffer days (1-2 days) at the end of the trip to accommodate such delays. We also organize heli rescue in such conditions, if it's available and upon request by our clients. The helicopter charges around USD 5000 and it can lift 4-5 persons per flight. If you are interested you can book some short Sightseeing tours listed on our website for your buffer days or just relax or do Sightseeing by yourself. In case, the flight delay/cancellation happens at the start of trip and it goes so long that it disturbs your onward travel schedule, you are free to choose any alternative trip: such a trek in the Annapurna, Langtang, or any other regions. If you are not interested in the alternative trip and would rather wait for the trip, you are welcome to wait in Kathmandu for as many days as it takes to get a flight to Lukla. However, please note that there will be no refund, if you lose your time waiting at the airport and do not take an alternative tour or you only do short trek later due to time limitation. If the cancellation happens before the trip, we will provide you accommodation and lunch in a guesthouse in Kathmandu. In case of the flight delay/cancelation after finishing of the trek, you will be responsible for all your expenses. Please also note that you will not be entitled to any refund for the services (such as hotel, transport, flight, etc) included in the package that you would not use later. Your safety is of paramount concern while traveling with us. Please note that your leader has the authority to amend or cancel any part of the itinerary if it is deemed necessary due to safety concerns. Every effort will be made to keep to the above itinerary; however, since this adventure entails travelling in remote mountainous regions, we cannot guarantee that we will not deviate from it. Weather conditions, health condition of a group member, unexpected natural disasters, etc., can all contribute to changes in the itinerary. The leader will try to ensure that the trip runs according to plan, but please be prepared to be flexible if required. After breakfast we will visit the Tourist Visitor Center near the headquarter of the Sagarmatha National Park where we can observe an assortment of things related to the first Everest ascenders, Sherpa culture and learn about the various plant and animal life of the Everest region. You have also great view of the Himalaya from there. Then we will continue our hike to Khumjung village, with a fantastic view of Ama Dablam (6812m). After that we will come back to Namche and spend the rest of the day there. Upon breakfast in Namche, we set out towards Tengboche. Today we have a pleasant walk, accompanied by uperb views of Mt. Everest, Mt. Nuptse, Mt. Lhotse, Mt. Ama Dablam and close up views of Thamserku. Along the way, we can spot wildlife musk deer, a herd of Himalayan Thar and multicolored pheasants. The trail is easy the first time, almost always going down or straight until we reach Phunki Thenga near Dudh Koshi River. There we will have lunch and after that we follow the path about 1 hour steep up to Tengboche through the pine forest. Tengboche is a great place for close up views of Mt Ama Dablam, Mt Nuptse, and Mt Everest, and it has the biggest Buddhist Monastery of the Khumbu region. If it fits we will visit the monastery the same day at around 3 pm to witness the ceremony in the principal and popular monastery of Everest region. In the morning we will continue our way to Pheriche. Our journey starts with a spectacular view of Tengboche monastery in front and the high mountains in the back ground. On arrival at Pheriche, we will see beautiful array of fields enclosed by stone walls to protect barley, buckwheat and potatoes from the cold winds and grazing animals. Today the way will be mostly straight the first time, offering stanning views of Tawachee and Cholatse. 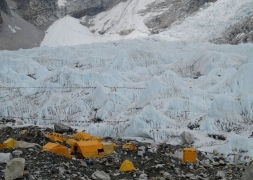 After reaching Dhugla we climb up the steep terminal moraine of the Khumbu Glacier. At the top of the ridge, we will find an array of stones with prayer flags used as memorials to Scott Fisher (American mountaineer) and many others who perished on a mission to climb Everest. As the trail drops to the Khumbu Glacier moraine, we find ourselves facing several great peaks - Khumbutse, Lingtren, Pumori and Mahalangur Himal. We are now in the vicinity of Everest but the great mountain still remains elusive. Mt. Nuptse towers to the right as the trail crosses the Khumbu Glacier. As we pass along a murmuring stream leaving the Khumbu Glacier behind, we now begin to feel a little out of breath due to high altitude. After breakfast in Gorakshep you will trek down to Lobuche. After breakfast, we trek via Khumbu Glacier to Kongma La Base Camp (5,000m/16,404ft). The ascent to Kongma La pass is the most difficult part of our trek today. In the Kongma La, we see cairn wrapped in prayer flags to mark the pass. Then we descend gradually to Imja Khola valley, followed by another descent to Chhukung, a small summer settlement. After reaching Chhukung we will also check our equipment in order to get ready for our ultimate climb. Overnight in Chhukung. The trek to Island Peak Base Camp is on a fairly steep trail. First, we climb south then turn east to the main line of the valley. We then walk on a winding path below the southern flank of the moraine from the Lhotse Glacier. Next, we continue walking on a pleasant trail along a streamside. The route to the Amphu Labtsa lies to the southeast. A crisscross route through the Imja and Lhotse glacier moraines leads to a wide valley flanking the SW side of Island Peak. Today we will not stay in a lodge, but in tents. We begin our pre-climb training today after breakfast. Our guides will provide training on peak climbing techniques and the proper ways of using climbing gears such as the ice axe, climbing boots and crampons, harness, ascender, etc. The training will also include using ropes to go up and down. Although it is not mandatory to have prior training for Island Peak Climbing, we strongly believe that some training experience will boost your confidence and climbing skills to increase the chances of scaling the summit as well as to fully enjoy the experience. We can spend the rest of the day hiking to high camp and back or resting for the next day’s climb. We wake up early today at around 1 to 2 am and have a short breakfast before beginning our climb. It is important to reach the summit before noon because in the afternoon the strong wind in the high lands might become a barrier for a successful summit. The trail moves up beyond the base camp for several hundred meters before striking off the steep hillside. Initially sandy, the path soon turns to grass before becoming boulder strewn. As we climb up the hill, we will see that the slope narrows and the trail enters a steep rock channel. We climb the rock gully. This is not difficult but there are several short rock steps to climb before we emerge on the right side of the gully. The route then follows a ridgeline, which leads to an exhilarating and exposed traverse onto the snout of the summit glacier. We need to rope up for the glacier as it contains several crevasses. The guides will fix a rope wherever necessary. A steep snow slope leads us onto the summit ridge. After enjoying the summit views, and taking pictures, we descend all the way to Island Peak Base Camp where some of our crew members are waiting for us. We celebrate our successful Island Peak climb. From Pangboche we walk down to the Imja Khola and then up through the forest to Tengboche. After lunch at Tengboche, we continue through the hillside blanketed by rhododendron and juniper trees. After crossing the bridge over the Dudh Koshi River, our trail follows the Dudh Koshi gorge descending rapidly through the pine forests before reaching Sansa. We keep a lookout for wildlife such as mountain goats, snow leopards, colorful pheasants, etc., while passing through the forest. After passing a chorten, we reach the army camp at Namche Bazaar. Island Peak climbing trip fulfills the dream of every amateur and serious climbers, who have been seeking the thrill of adventure and wish to widen their experience towards the peak climbing expedition beyond simply trekking in Nepal. Island Peak, also known as Imja Tse (6,119m), lies to the south of Everest and is one of the most popular trekking peaks. Climbing Island Peak is well within the reach of any fit and determined trekkers as it is not a technical, though demanding snow climb.